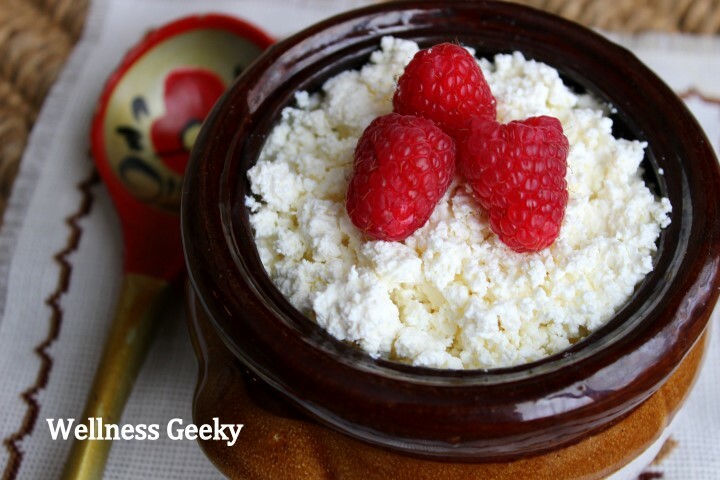 I can’t imagine my life without homemade cottage cheese (aka farmer's cheese or tvorog). This is one of the best breakfast options you can imagine. It’s high in proteins, low in carbs. Exactly, what you need to kick your metabolism in the morning, so you burn your energy (think fat) effectively. And don’t forget about all Calcium you will get from that cheese. It has low glycemic index, meaning it won’t raise your blood sugar fast. Plus, it will help you to keep your leptin in balance, meaning less desire to binge on something sweet and unhealthy. Most importantly it tastes great, so even your kids will eat it after you add some honey and fruits. Besides eating it straight you can use it in various recipes, including healthier gluten free desserts options. Hopefully, by now you all excited to start to make your homemade cottage cheese, so here’s a recipe. Pour your milk in the pot. Add your starter: for probiotic, 1 tsp. is more than enough, for any other product of lacto-fermentation like yogurt, sour cream, buttermilk, etc. – 1 cup will be most likely sufficient. Let it to ferment until soured milk starts to separate from wall of the pot, when you tilt it. If you plan to make cottage cheese again, take a little jar and fill it with your cultured milk. That will be your homemade starter, which you can add to milk next time you will be doing cheese. Then put your fermented milk on the stove on low heat. 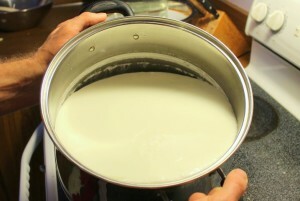 When bottom of the pot will become hot, stir it carefully, trying not to break the curd much. You may need to repeat that one more time. Cook your soured milk until curd separates from whey or temperature reaches 130F. The good indication that curd has separated is that a spoon is coming out clean after you dip it in the pot. Let it cool naturally or put in cold water (you can add ice) to speed up cooling. Put colander in the sink and lay it with cheesecloth. When your curd and whey mixture is a room temperature or lower, pour it into the colander with cheesecloth. Put another pot under colander, if you want to collect whey, or let it flow into the drain. Tie cheesecloth around cheese and press as much water as you can with your hands. Leave it in colander for 10-30 minutes, then transfer to a container of your choice. Refrigerate and enjoy for up to one week. What kind of milk to use? Obviously, to make a cheese you need milk. Whole organic milk is better than regular one, but unpasteurized non homogenized whole milk is the best for cheese making, as it produces better curd. Strangely, in US it’s easier to buy weed than raw milk, so relax and go with store-bought gallons of milk. Ultra-pasteurized milk will give you the most inferior result, even if you will do the rest of steps perfectly. What is the best type of starter? To make cottage cheese you need to sour (ferment) your milk. Milk will sour even, if you do nothing to it and just let it sit on the counter at room temperature (there are lactobacteria in the air). To speed up process you can add something fermented like yogurt, sour cream or buttermilk. But the best way is to add multi-strain probiotic, containing different strains of Lactobacillus and Bifidobacterium. As every strain has some unique effects on milk fermentation. Plus number of bacteria in probiotic is much higher compared to even the freshest yogurt. Multi-strain probiotic will sour your milk in superior way than bacteria from yogurt or other fermented dairy product. Though, not all probiotics are made equal. Brand called Primadophilus is one of the best probiotics on market. I give it to my kids, I take it myself, and use it in the kitchen. This brand was tested by independent lab and was shown to stand upon all its claims on the label and has no contaminants. Update: When you start with a new probiotic, you never tried before, it's always a good idea to sour a jar of milk first, and to see, if everything goes as expected. It should smells pleasantly and looks yogurty. Use this jar as your starter. In this way you will activate bacteria in your probiotics and won't spoil the whole pot of milk. What is the most right way to cook your cultured milk? The most proper way to heat cultured milk is on a water bath or in a double boiler. As it prevent burning of the bottom and give you the most even heat distribution. If you use only 1 gallon of milk for cheesemaking, you can ferment it in a gallon-jar as it will later easily fit in the large pot with water. That means you can heat fermented milk on water bath. In terms of temperature 125F is point when curd starts to separate from whey. Optimally, you need to keep this temperature for 30 minutes then cool down your cheese right away. But this is hard to achieve at home without special equipment. That is why I always add extra 5F and bring my soured milk to 130F, then turn the burner off and let cool it gradually. Extra time for cooling gives the chance for curd to separate better. But obviously, you can’t figure out temperature of your future cheese without thermometer. And if you want to make good farmer’s cheese I highly recommend to buy one, especially that the simplest one cost only a couple of bucks. How fast milk will sour? But generally, it will take anywhere between 12h to 48h for milk to sour. How to speed up cottage cheese making? Heat milk up to 90F (slightly warm) before adding starter. How long homemade starter can be stored? Homemade starter can be stored in the fridge for up to one month. After constant use starter can get contaminated with other bacteria and will start to have foul smell. It’s a good indication that it’s a time start everything over and make a new starter. Proper cleaning of everything what comes in contact with your cheese will help extend shelf life of your starter. What to do if you overheated your cultured milk? If you overheated you soured milk (above 150F), your cottage cheese will end up being too dry and gummy. It won’t taste super good, but you can still use it in recipes like Russian style cheesecake (Zapekanka) or top your potatoes with it before roasting in the oven. What to do if whey doesn’t want to press out of cheese? It means that you undercooked your soured milk. You have two options either to heat it again or put your cheese wrapped tight in cheesecloth and in the colander to the fridge. When cottage cheese is cooled to fridge temperature it starts to let go extra water. Though end product will be still inferior to what you would get normally. Undercooked cheese also spoils faster. What you can do with whey? The benefits of whey deserve its own article, but in short you can drink it, you can use it in bread and dough making and as substitute of milk in muffin recipes. How to care for your cheese cloth? Besides washing thoroughly, you can boil your cheese cloth in water with half a cup of baking soda; or wet with hydrogen peroxide, let it work for five minutes, then rinse. As I explained above, I simply pour cooked soured milk through cheesecloth, then wrap cheesecloth around cheese and apply some pressure to express the whey and leave it to rest for some time. Other people cover cheese with a small plate and put something heavy on it, so whey is squeezed out by weight. Or hang cheesecloth with cheese on something and keep it like that until whey stops to drip.I found that it’s completely unnecessary and only complicating the process. Though you can use extra weight, if you undercooked you milk and have trouble to separate whey from curd; or if you need very dry cottage cheese for baking purposes. Hi Julia, how long does it take for the milk to ferment after you add probiotics? Hi Lola, it depends on the temperature of the milk and temperature inside your home. It can take from 12 to 36 hours to sour the milk. Just check milk every 12h by tilting the pot and seeing if milk separates from the wall.